The training will take place at the Waterfront Ballroom at the University of Windsor in Ontario, Canada. For WITNESS, Libby will be developing the Video as Evidence Program’s guidance on using video to support justice and accountability for sexual violence crimes. Our project investigates how video and open source data gathered by local groups can help corroborate incidents of abuse and help communities tell their own stories. In 2011, citizen video helped spark a movement across the Middle East and North Africa. Today the importance of documentation remains constant—but faces new challenges as we mark the 7th anniversary. “Eyes in the Sky: Drones at Standing Rock and the Next Frontier of Human Rights Video,” a new report published, examines how activists and journalists used drones to document the protests by Native American tribes and other advocates against the construction of the Dakota Access Pipeline. 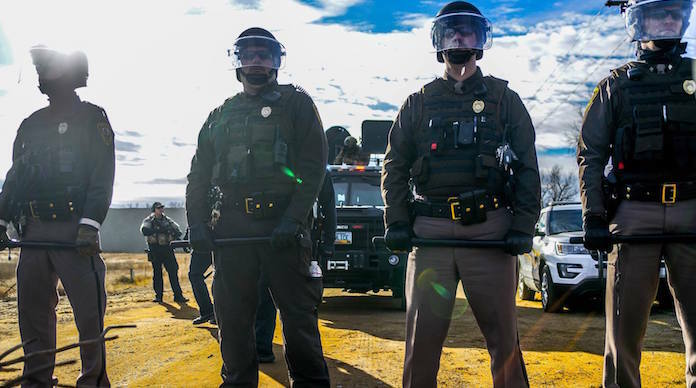 WITNESS, WeCopwatch and our allies at Standing Rock are releasing a new guide on filming evidence of human rights violations against activists fighting the construction of the Dakota Access Pipeline.